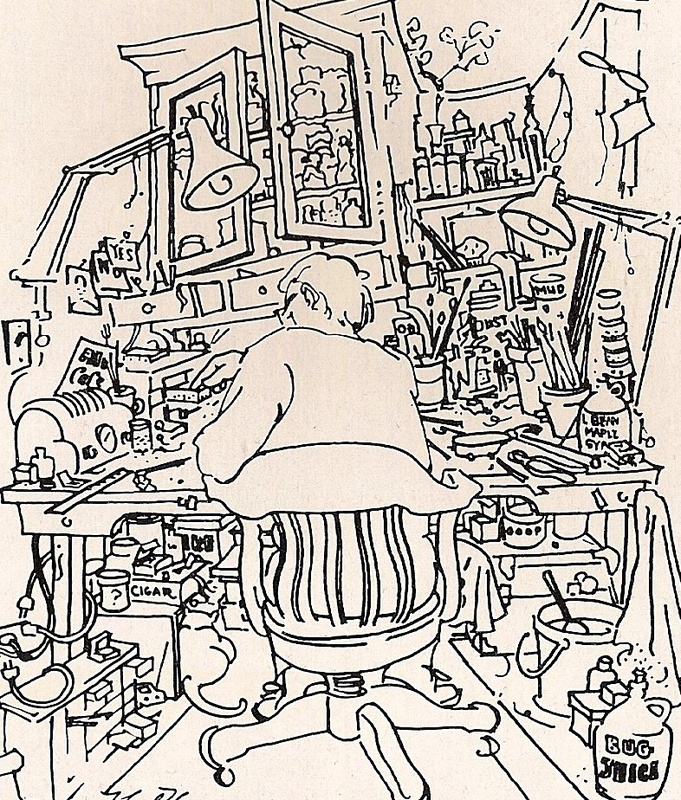 What Noel began in 1974 as an odds and ends drawer in the studio overflowed to engulf an entire wall of shelves, and most of the surrounding drawer, floor and wall space. Found bits like Ronson lighter springs, trout fishing swivels, rusted tin cans, part of a leather glove, and defunct tape recorder components shared space with odd lots I found in catalogs catalogs, thrift shops, fabric and hardware stores. Added to that were the multiple boxes of leftover plastic plumbing parts from Chrysynbon kits. When I married Noel, a Northwesterner, I thought only New Englanders like my father never threw anything away. Over the years though, I came to appreciate the value of making miniatures by the accrual method. I delved into our stockpile regularly, searching for substitute shower curtain rings, screen door springs, cupboard handles, or birdhouse feathers (from a dead baby bird–roadkill). In the accumulation trade I became my father’s daughter, as well as my husband’s wife. In miniatures, no string is too short to be saved. And, yes, there was a drawer for anything that arrived tied with string. Our collection not only provided us with an endless warehouse of supplies, but also gave our work a singular identity. When our students asked how we made a deep fat fryer, shower stall, or fold-out ironing board, we fell back on the sly cook’s replay, “a little of this, a little of that.” Not that we intended to mislead, but so much of our work came from pieces at hand. Pieces that you can find every day, if you save what you find. A truly creative miniaturist needs to accumulate. Plus, for us, we had no easy access to miniature shops. The Maine Idyll Motor Court bathroom was a good example of how we used “stuff.” To create the proper atmosphere for the tiny bathroom, Noel built the toilet starting with a plastic Chrysynbon kit he painted to look like porcelain (starting with trimming any flashing from the parts, gluing them together, spraying with grey auto primer, then glossy white). He also re-designed it so the water tank was behind the seat, rather than on the wall above. 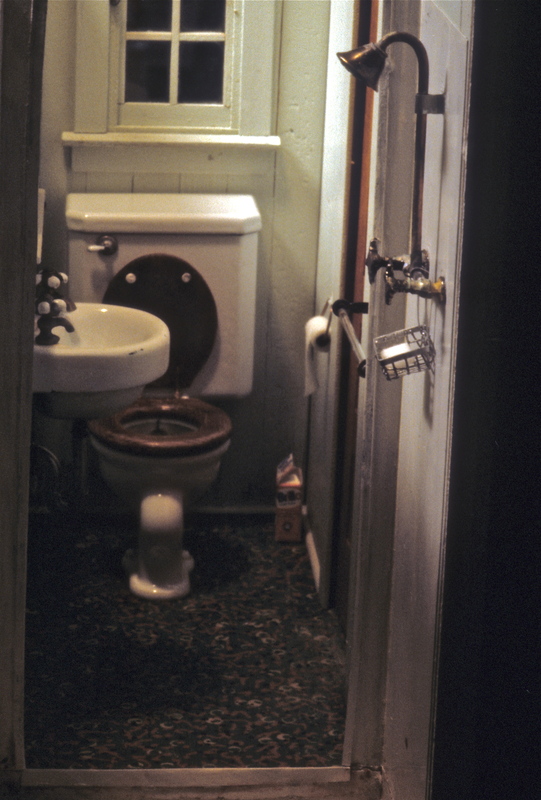 No bathroom is complete without toilet paper, so he made a rolling dispenser by looping a bit of copper wire, then, using our full-size 1950s garage apartment fixture as a model, he cut a minimally decorative “chrome” hanging bracket from a piece of wine bottle lead embossed with a lead pencil. For paper he used the real thing, wrapping it around the wire a time or two, then leaving the leading edge hanging. As with so many of our seemingly minor touches, the toilet paper caused more comment than the rest of the bathroom. The shower curtain is barely visible on the left. I made it from a shopping bag which I pleated and ironed into a bit of a drape, then glued it in the open position. The curtain rings were coils cut from an old spring. The bathroom also needed a shower stall. Our vintage tin model pre-dates fiberglass. The metal stall was made from aluminum printing plate, salvaged from a job I had at the local printery, those many years ago. Now they are probably to be found only in the recycle bin. These negative plates, on which letterheads and brochures were printed, were a little thicker than beer can aluminum, and cut easily with an X-Acto knife. The shower bottom is a tabbed open box to which the walls are glued. The shower was 2” deep X 2 ¾” wide X 6” high, to fit the cabin bathroom. We only built the two side walls and the bottom. The back shower wall was left out for viewing, since it was designed to be built into the open wall of the project. To cover the sharp edges and add strength to the front framing, Noel cut edge stripping from the original sheet of aluminum, scored them with the knife before he glued and folded them over the edges. (A more explicit set of directions can be found in the September 1991 Nutshell News). The shower drain was made from a small steel washer aged with Brass Black before being glued in place. The grunge detail and rust-edged shower floor were achieved with our standard wash of Burnt Sienna tube paint, accented with Sap Green tube watercolor for a touch of mold (it’s always good to have shower slippers packed in your bag for such situations). Applying the green to the still-wet edges of Sienna makes a good, subtle mold mix. 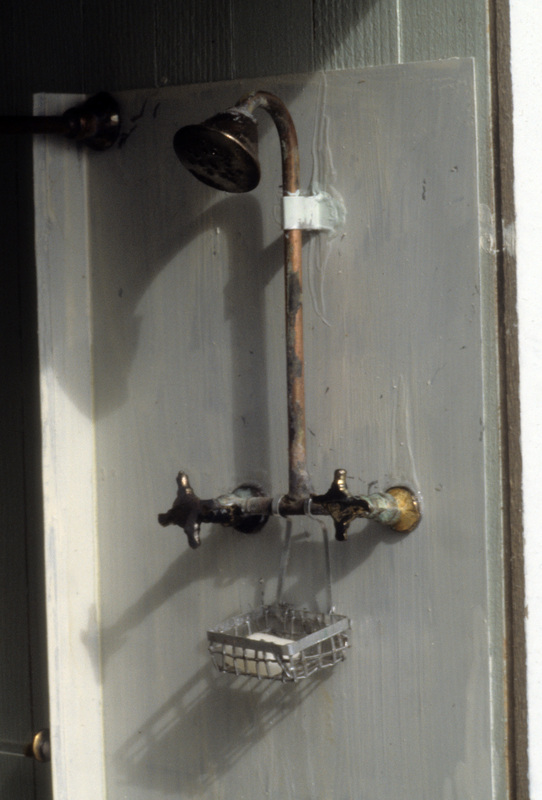 Do this lightly—you want the look of rust and mold, but a still useable shower. Another delving in our Salvage Department resulted in the shower plumbing. The water pipes, leading from the wall to shower head, are made from 1/16” copper tubing. Run a length of wire in the tubing before you bend it to prevent crimping. Noel the soldered the tubing into the upside-down T shape with the cross of the T leading to the hot and cold faucets. The length led up to the shower head. He then bent the curve into the “pipe.” The shower head is a bell-shaped brass ceiling cap left over from a Lighting Bug light fixture. The cap is filled with lead solder, and the spray holes drilled with a manual drill press. The solder was then aged with Caming Darkener (stained glass supply), and the rest of the metal with Brass Black. The shower faucet handles are mini brass sink-mount faucets of unknown origin (possibly Houseworks or Realife). Noel cut off most of the stem end, leaving a short tip which he filed to a point and instant glued into the T ends of the copper pipes. 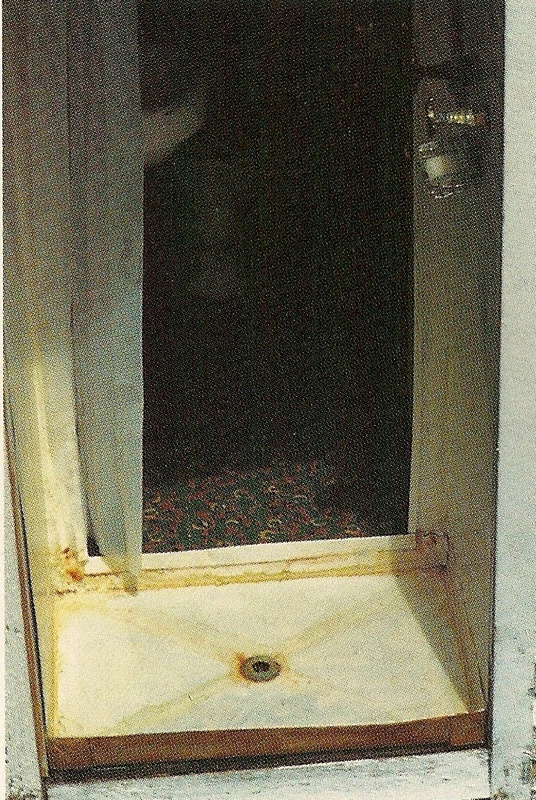 The handles were still mounted on their original bases, which served as the wall mount. 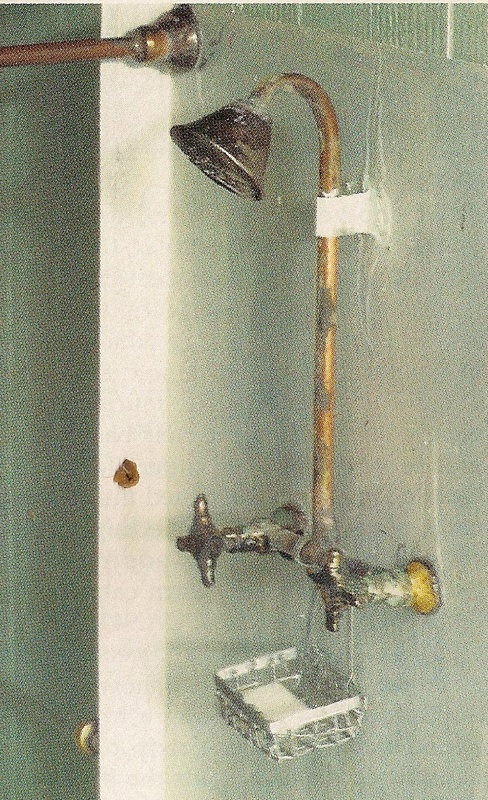 Once the handle apparatus was glued into the pipe ends, the whole thing got a final aging with Brass Black, plus a little patina green on the pipes, shower head and faucets. Our custom soap basket is made from old metal wire window screen, and more of the aluminum printer’s plate. We flattened the wire with a hammer, cut a square out of it, clipped the corners and made a shallow box the same way the shower bottom was constructed. The framing is a strip of printer’s plate, as are the hangers over the copper pipes. And, yup, the soap is carved from a bar of soap. And to hang your towel, Noel made glass rods from chem lab pipettes (alas, no decent photo available) given to us by a friend. He bracketed them with some indescribable hardware he shaped to fit around the rods and attach them to the wall. Best of all, to secure the brackets on the rods, he used the heads of two brass straight pins, inserted into the ends of the glass tubing. I say best of all, because several years before that I bought a 5 lb.box of pins for a song from a JerryCo Catalog, thinking someday we might need them. As a postscript I wanted to mention that as we dismantled our miniatures studio, I tried to find homes for most of our collected goods. It finally came down to too many little boxes and drawers of uncategorize-able surplus to try to dole out bit by bit, and certainly too much to ship anywhere. A past student volunteered to take it all, sight unseen, and that she did one day last October, to my great relief. Relief until she drove out of sight, when I realized I’d said goodbye to something firmly attached to my heart. 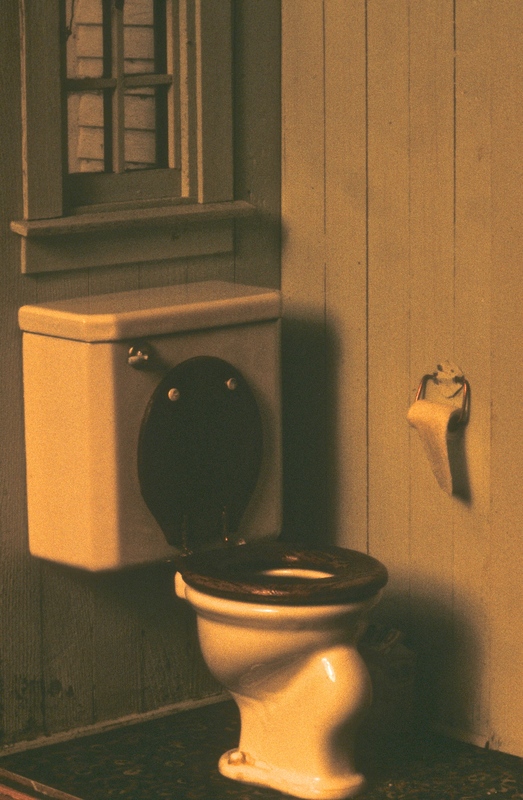 This entry was posted in Miniatures and tagged bathrooms, miniatures, Roadside architecture. Bookmark the permalink. This bathroom is so inspiring, beautiful! Such atmosphere. I am constantly saying “junk is your friend”. I started with a little box some 30+ years ago, my “junk box” Now there has to be at least 40 junk boxes in my shop…..everywhere…. Sure I save some obscure stuff but I know I will be needing just that someday 🙂 And I always do find uses…yeah junk is your friend! Love reading the details of your process, and seeing the photos. Having just fiercely downsized my studio and potentially-perfect accumulations to move back ‘cross country, I feel your twinge of letting go. Thank you. I have bits o’ (what we call all the miscellaneous “I might need them someday” things) everyplace! I learned my lesson about getting rid of the excess last year when I went to my studio to search for a piece of fabric only to realize it had been in one of the many boxes of fabric and sewing items I donated to a good cause a couple of years earlier. In the midst of depression, I thought I should clean house of all these things I never used. Lesson learned. Never, ever, never give up the junque. I started doing miniatures only three years ago and I always admire the ability to give a worn aspect to rooms and objects. It makes everything look so real. So I read your post with great interest and I thank you for giving useful information and hints. And regarding Noel Thomas drawing, it is so true!!!! My introduction to 1 inch miniatures, in the early 80’s, was by way of an article I came across featuring your miniature work. I was so impressed with what you were doing that I began searching for articles and information about you. I started subscribing to miniatures magazines and attending miniature shows. When I began to seriously build in 1/12th I used your work as a benchmark for my own. In brief, you were the inspiration that led me to my pursuit of miniatures as an art form. I warmly invite you to visit my webpage and take a look at my work and profile. You’ll also find a copy of an article that appeared in issue #47 of AIM magazine about me and my work. Dollhouse Miniatures magazine is planning on doing an article on me and my work in the near future, an event that I am extremely pleased and excited about. I am an IGMA member and associated with “The Camp” and AIM miniature forums. Thank you both for your inspiration. Glad we could be useful. Looks like you’re having fun with aging! Pat – If it is any comfort – please know that every spring, feather, rust particle and stray bead is treasured and has spurred my imagination. Thank you Pat for sharing so much of your talent and telling us how you and Noel put things together. I drink up your posts like they were water! My hands have deteriorated and I don’t make as much as I use to but to see your pictures and read about the process is thrilling! p.s. I looked all through NN Sept 94 and couldn’t find it. Hi Judy, Glad you’re enjoying them, and thanks for the sharp eye–I goofed, the issue is NN Sept. 1991. Hi Pat and Noel! I have been so inspired by the two of you since way back in the 80’s when I began to get serious about miniatures and would attend the Seattle Miniature Show and see some of your work there. There was no one like you and then and to this day. It is because of the way that you not only built from scratch but also all of the minute details that you achieved with every project that you undertook. I have used your work for reference through old Nutshell News articles and your bathroom for the little one room cabin remains a great favorite of mine. So glad to get the opportunity to say Thank You for all of the Paving of the Way that you two pioneers took by making the look of old and aged, a real thing of Beauty! Elizabeth, What a wonderful message to wake up to on a cold Monday morning in February. Thank you, and you’re welcome, we’re glad we’ve been a help. Dear Pat and Noel. I cannot tell you how timely is this post. I’ve been struggling with my ‘junk’ AND my husband’s junk for a very long time. The urge to purge keeps rearing its ugly head but I know that what is really needed is simple organization. I am truly sorry that you had to let go of your collected bits but it is wonderful that they went to someone who is inspired by them. Thank you for your beautiful posts and the gifts of inspiration you’ve shared. Daphne, Glad my post struck a note, but as you say, organization is they key, and I was never very good at that. HAve fun with your stuff.